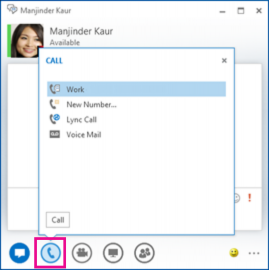 Before using Lync to make a call or join a conference, set up your audio device and check the quality. You can use your computer's mic and speakers, or plug in a headset. 1. 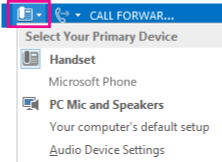 Click Select Primary Device on the lower-left corner of Lync, then click Audio Device Settings. 2. Pick your device from the Audio Device menu, and adjust Speakers and Microphone volume. 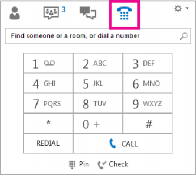 Click the numbers on the dial pad or type the number in the search box, then click Call. 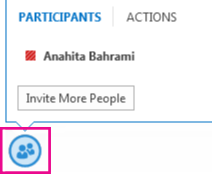 Right-click the selection , then click Start a Conference Call. 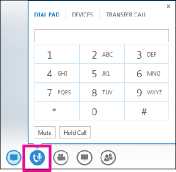 Pause on the Phone icon in the IM window and select one of the numbers. You have options such as work, mobile, or home (if published) for your contact. You can also click New Number, and type a number to call. 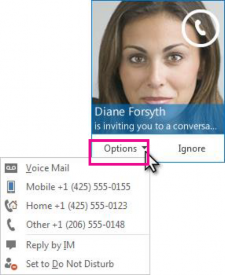 Click the Phone button to call the contact using Lync, or clicke arrow next to the Phone button and select a number.